I’m still working on my Christmas scrap fabric pieces. This week have done three more pillows, see tutorial on my tutorials page. 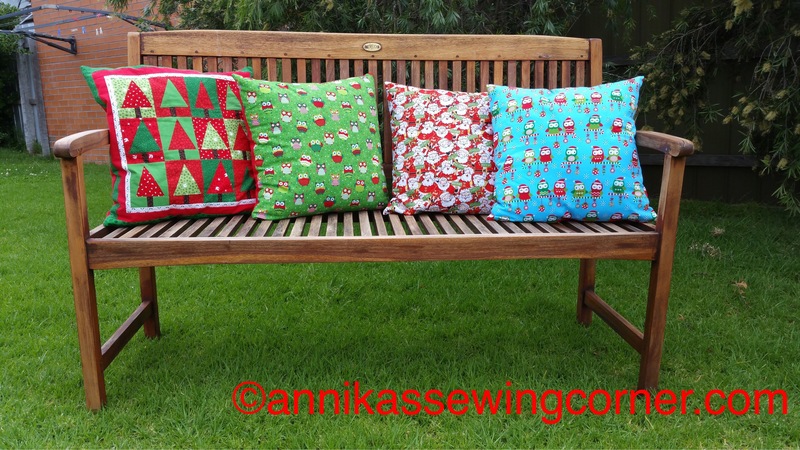 They are very easy to make cushions with printed Christmas fabric on front and a plain back. The rest of the left over fabric scraps are not big enough and I don’t need more Christmas pillows. I have cut the rest of the scraps in to 2″ x 3 1/2″ pieces and are going to make a pick nick quilt which is very useful here in Australia. So far I’ve cut the scraps that’s from when I lived in the US for a couple of years. The colours are a bit different from the colours here that I have used in the pillows. I’ve also put up the tree and decorations today. Maybe a bit early but I have a really busy couple of weeks in front of me. I hope you’re having a good weekend too. Until next time happy sewing and take care.